Posted on September 1, 2017 by Dr. Dale Rubenstein. Hurricane Harvey caused tremendous damage to the eastern parts of Texas and the gulf coast, and now Hurricane Irma is gathering steam before heading towards the U.S. While we all hope never to hear about 50” of rain again, Harvey and its effects are a reminder about being prepared for emergencies. Do you have a cat emergency kit? 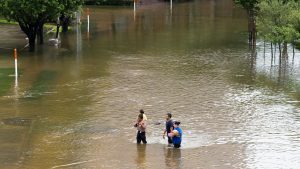 Here in Germantown and central Maryland we may not be likely to suffer such severe flooding as we’ve seen in the past week, but power outages are not uncommon . If temperatures were extremely hot or cold and your home was without power, you could be forced to consider emergency relocation. Here are six easy steps you can take to make a cat emergency kit and help prepare your cat for disaster. We recommend keeping the carrier in the home as “part of the furniture”. This way it it less scary when your cat needs to be transported someplace. Keeping a blanket, shirt or towel with familiar smells will provide some bedding and is also comforting to your cat. 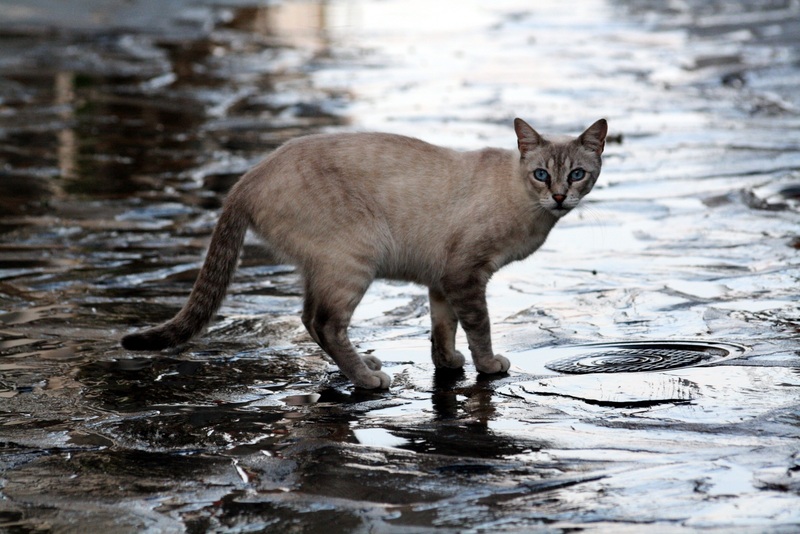 Vaccination records: If you needed to suddenly board your cat, wherever you board him or her you will need to show when the most recent vaccinations were given for FVRCP (Feline distemper/upper respiratory viruses) and Rabies. Testing: Knowing Feline Leukemia Virus (FeLV) and Feline Immunosuppressive Virus (FIV) viral status is also important. At A Cat Clinic, we document that at your cat’s first visit. If you’re unsure, please call or email us and our receptionists can let you know whether (and when) your cat was tested. Microchip number: We strongly recommend having a microchip placed in all cats, and have written many blog posts on this topic (most recently Microchip Your Cat! A Reminder from April the Cat). Typically, we place a microchip when cats are spayed or neutered, although it can be done during an office visit. Always keep your information current with the company that registers your cat’s microchip. Medications: Keep a current list of any medications, doses and dosing schedule (how frequently you give the medication). If your cat has medication that requires refrigeration, make sure you have an insulated container and ice packs for transport. Pet insurance documents: Bring these along if you have pet insurance for your cat. Bring food, treats and water bowls (unbreakable stainless, or plastic if your cat isn’t allergic), and spoons or measuring cups. Write down the type and amount of food you feed, in case someone else has to feed your cat. The low-sided cardboard box that canned cat food comes in makes a great disposable/emergency litter box! Shredded newspaper can be less messy than litter, although not all cats will use it. Plastic trash bags and paper towels come in handy for many uses, not just for your cat! You can keep many of the items on this list stored in a plastic bag that’s ready to grab and go in an emergency–and could serve double-duty if necessary. Write down your emergency contact information, and leave a copy with a family member or close friend. The American Veterinary Medical Association offers a free downloadable Pet Emergency Contact Card. The Humane Society of the United States has put together a great list of additional steps you should take when making a Disaster Plan. We all think disasters happen to “someone else”. That is, until one happens to you. Fortunately they don’t happen often, but even in Maryland we have tornadoes, localized floods and ice storms. These may only affect a small area, but next time it could be your neighborhood or even your house. So take these simple steps and put together a cat emergency kit to prepare your cat for disaster–and then hope you never need to use it! VIN Foundation: The Veterinary Information Network (VIN) has created a fund to provide direct relief to Texas veterinarians who are providing shelter and treatment for pets affected by the storm. They are covering all credit card processing fees, so 100% of your donation goes to help those in need. Just choose Harvey Disaster Relief in the Gift Designation drop-down list. Houston Humane Society: This group is housing many of the stray pets who have been rescued. You can give directly to their Hurricane Harvey Fund.